An ion channel is a protein macromolecule that crosses the breadth of a membrane and allows molecules to pass through. The ions move in a direction determined by the electrochemical gradient across the membrane. Ions tend to flow from an area of high concentration to an area of low concentration. In the presence of a voltage gradient, there may be no flow of ions despite unequal concentrations. Ion channels can be open or closed. Opening is brought about by changing the voltage across the membrane, or binding a chemical substance to a receptor. Most important role is that they provide the neuron with electrical excitability. Found in all parts of the neuron and to a lesser extent in the neuroglial cells. The channel must be able to move from open to closed state, and back. Must be able to open in response to the appropriate stimuli. Some channels respond to chemical stimulus (particularly at the synapse). These channels have specific receptors for that chemical, that leads to channel opening. In the resting state, the neuronal cell membrane is fairly impermeable to ions. This is crucial for the generation of the resting membrane potential. The major intracellular ion is Potassium (It is sodium in the extracellular fluid). The natural flow of ions by way of their concentration gradients is for K+ to leave the cell and Na+ to enter. This movement of ions out of the cell leads to a negative membrane potential - Hyperpolarisation. The opposite is true for a relative influx of ions - Hypopolarisation. 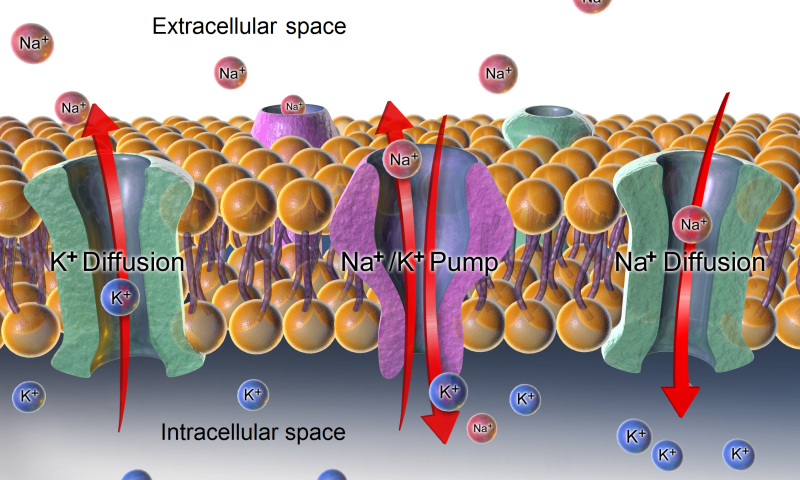 The resting membrane is relatively impermeable to Na+ ions, while remaining permeable to K+ ions. So when the membrane is at rest, there will tend to be an efflux of K+ ions out of the cell, down its concentration gradient, leaving excess negative charge behind. This continues until the chemical concentration gradient that is driving out the K+ from the cell is exactly at the point where it is offset by the electrical potential difference generated by this efflux. (the membrane potential) K+ is then drawn back into the cell. This steady state of the membrane is called the Equilibrium Potential. The equation for deriving the equilibrium potential is called the Nernst equation. There is actually a slightly unexpected increased positive charge in axons due to a small permeability to Na+ ions of the membrane in the resting state. This is offset by ATP dependent Na+/K+ exchange pump. I pumps out 3 Na+ ions for every 3K+ ions brought in to the cell. However, it makes only a tiny contribution to the resting membrane potential of the cell. Defined as a "single electrical impulse passing down an axon". It is all or nothing in its action. This means that once the threshold stimulus intensity is reached, an action potential will be generated. Information in the nervous system is coded and interpreted by the frequency of firing, not by the size of action potential. The AP most readily occurs at the axon hillock because this is where there is a greater density of Na+ ion channels. It is for this reason that this is the site of AP initiation in the neuron. If the threshold is not reached, the action potential will not be generated, and transmission of the signal is terminated at that point. Depolorising voltage activates the voltage sensitive Na+ ion channels in the neuronal membrane: Na+ ions flow down the electrochemical gradient. Membrane is depolarised further. Further Na+ channels open in aPositive feedback loop. When there is a greater inward current of sodium ions compared to the efflux of K+ ions, there is fast opening of all Na+ channels. This depolarises the membrane towards the equilibrium potential for Na+(+55mV). Spike of AP is generated, but fails to reach equilibrium. potential for Na+ due to the increasing K+ efflux. As the Na+ channels become less active the AP falls. This inactivation is voltage dependent. During the falling phase the K+ current is important as it leads to a short period of membrane hyperpolarisation before it deactivates. Membrane potential returns to the resting state. 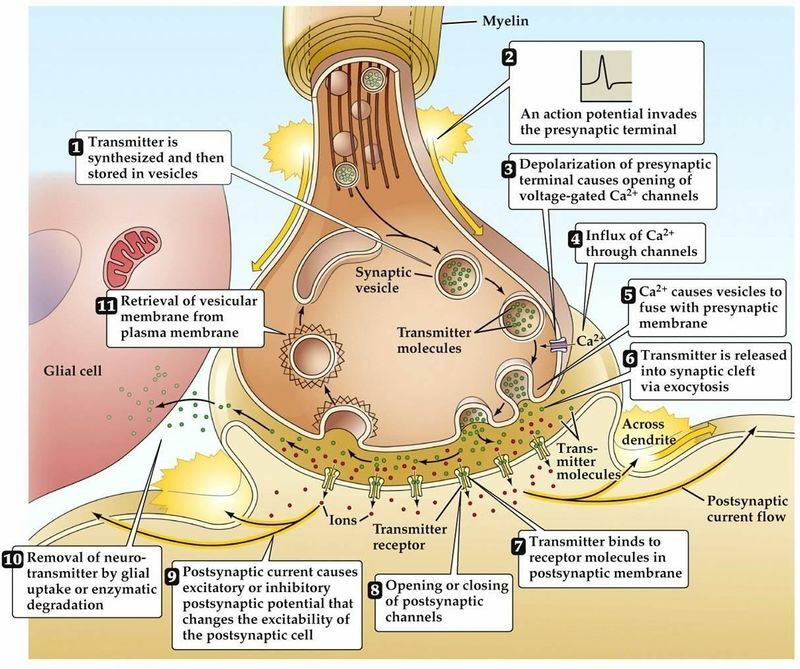 The chemical synapse is the predominate one found in the nervous system, however electrical synapses are found in cardiac muscle and glial cells. Action potential arrives, leads to depolarisation of the presynaptic terminal. Voltage dependent Ca2+ channels open in the active zones of the terminal. This leads to influx of Ca2+. Influx of Ca2+ leads to phosphorylation and alteration of amount of presynaptic calcium binding proteins. This liberates the vesicle from its presynaptic actin network, It then binds to the presynaptic membrane. The fusion of the vesicle to the membrane leads to the formation of a small channel, which quickly expands and releases its contents into the synaptic cleft. The vesicle membrane is recycled by endocytosis. Released neurotransmitter diffuses across synaptic cleft with the goal of binding to the postsynaptic receptor. Activation of the postsynaptic receptor leads to a change in the postsynaptic membrane potential. There are alternative theories that suggest that the neurotransmitter is delivered via molecules or membrane channels rather than vesicles. Action potential propagation is achieved by local current spread. The nerve is insulated with myelin if its size is above a certain diameter, with the Nodes of Ranvier at various intervals along its length. Action potential leads to depolarisation of the membrane immediately in front (and behind). The membrane is in a refractory state, so the action potential is only conducted in 1 direction. This is feasible in small axons, but the spread of current is slow. Same sequence of events as in the unmyelinated axons. There is however a significant difference. The progressing action potential encounters high resistance, low-capacitance structure - myelin wrapped around the axon. The depolarising current passes along the axoplasm, until it reaches the low resistance Node of Ranvier with its large amount of Na+ channels. The action potential is then generated at this site. Action potential is conducted from node to node. This is called Saltatory Conduction. Minimises metabolic demands on the cell. Increases packing capacity of the NS, allowing more fibres to be crammed into 1 nerve. Most nerves greater than 1 micron are myelinated. Disturbances in conduction are normally due to demyelination pathologies. They include Guillan Barre syndrome and Multiple sclerosis. Each central neuron receives many hundreds of synapses. Each of these inputs is than integrated into a response by that particular neuron. This involves processing all the inputs that arrive at any one time. This is called spatial summation. Processing inputs over a set period of time is called temporal summation. There will be a mix of excitatory and inhibitory synapses acting at this point. Binding of neurotransmitter leads to opening of ion channels. Depolarisation of the membrane occurs. EPSPs depolarisations recorded in the post-synaptic cell to a particular excitatory stimulus. Depolarisations assoc. with EPSPs can go on to trigger APs if summation occurs at the synapse. Ion channels allow postsynaptic anion influx when open. important for modulating the neurons response to excitatory input at the synapse. Found in strategically important sites of the neuron such as the proximal dendrite and soma. Some neurons provide their own inhibitory influence by having axon collaterals and their own inhibitory interneurons. This is termed feedback inhibition. Eg. motorneurons and Renshaw cells in the spinal cord. The neurotransmitter is released at the synapse and works with a specific protein in the postsynaptic membrane called the receptor. In some synapses the neurotransmitter may also be found to interact with a presynaptic autoreceptor. The PSA acts as a regulator of the amount of transmitter released. Receptors are normally specific for a particular neurotransmitter. There are several types of receptor. Co-released neurotransmitters may regulate the binding of another transmitter. Activated receptor can only return to its resting state once the neurotransmitter is removed by the process of enzymatic hydrolysis (uptake) into the presynaptic nerve terminal or into the nearby glial cells. Desensitisation/Down regulation: A decrease in affinity of the receptor for the transmitter in the short term, in the longterm, this leads to a decrease in the number of receptors. Supersensitivity/Up regulation: An increased affinity of the receptor for the transmitter in the short term can lead to an increase in channels in the longterm. Metabotropic : G-protein associated glutamate receptors that respond by initiating intracellular biochemical events, modulating synaptic transmission. Excitatory Amino Acids: These are the main excitatory NTs in the CNS. The main NT in this group is Glutamate which acts at a number of receptors. Inhibitory Amino Acids: These are the major inhibitory neurotransmitters, the main one of which is GABA, present throughout the CNS. Glycine, found mainly in the spinal cord. Monoamines: Found in small groups of neurons in the brain stem, projecting widely into the CNS. Found in the autonomic NS. They bind to a host of receptors. Acetylcholine: Widely distributed throughout the nervous system, including the neuromuscular junction and autonomic NS. Neuropeptides: Found all over the NS. Often released simultaneously with other NTs. In addition, over 50 neuroactive peptides have been found, and new ones are discovered regularly. Many of these are "co-released" along with a small-molecule transmitter. Nevertheless, in some cases a peptide is the primary transmitter at a synapse. β-endorphin is a relatively well known example of a peptide neurotransmitter because it engages in highly specific interactions with opioid receptors in the central nervous system.